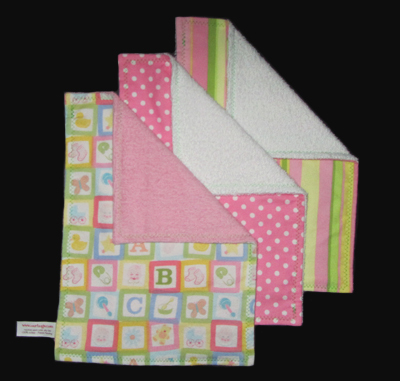 Set of 3 burp cloths. Made from ultra-soft, high quality flannel, backed by durable terry cloth. All coordinating fabrics. Multi-color alphabet/pink terry, candy dot/white terry, pink and green stripes/pink terry. 13"long x 8"wide. Made in the U.S.A.!! 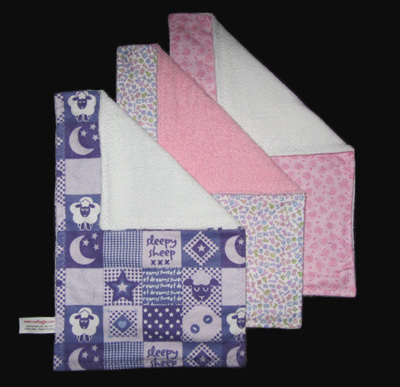 Set of 3 burp cloths. Made from ultra-soft, high quality flannel, backed by durable terry cloth. All coordinating fabrics. Purple sheep flannel/white terry, pastel alphabet/blue terry, red/blue stripes/blue terry. 13"long x 8"wide. Made in the U.S.A.!! 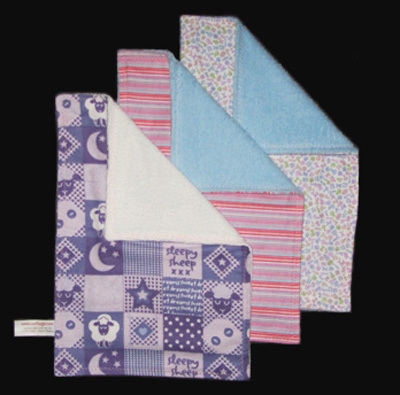 Set of 3 burp cloths. Made from ultra-soft, high quality flannel, backed by durable terry cloth. All coordinating fabrics. Purple sheep flannel/white terry, pastel alphabet/pink terry, pink hearts/white terry. 13"long x 8"wide. Made in the U.S.A.! !